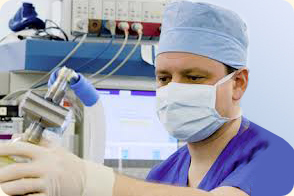 The general anaesthetic is administered in either the operating theatre itself or a special ante-room. General anaesthesia can be induced by intravenous injection, or breathing a volatile anaesthetic through a facemask. Onset of anaesthesia is faster with injection than with inhalation, taking about 10-20 seconds to induce total unconsciousness. This has the advantage of avoiding the excitatory phase of anaesthesia, and thus reduces complications related to induction of anaesthesia.